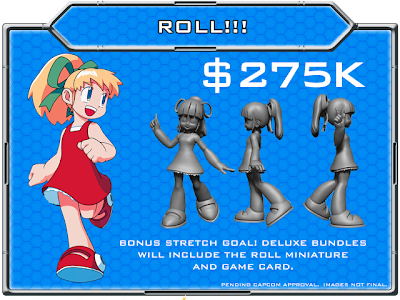 "Deluxe bundles will now include Roll and her game card! She is also available as an Add-On for $10 if you want to add her to your base game, or if you want extra Roll's to play around with! Next Up Cut Man Stage Upgrade. You will get an additional Mega Man miniature in all games with this upgrade too so stay tuned!" 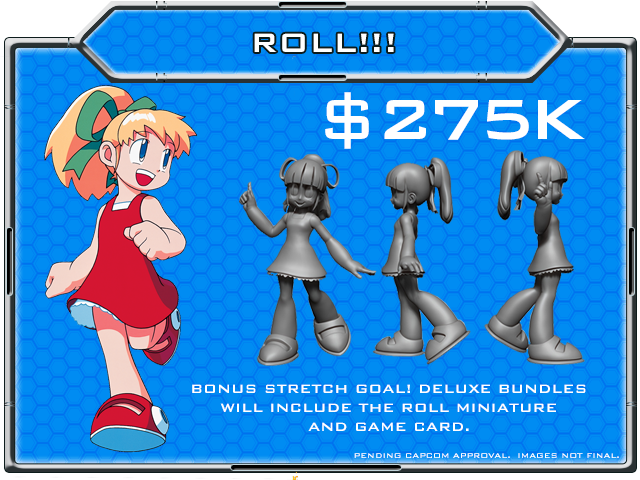 If you'd like to add Roll to your bundle or adjust your pledge, you know where to go. Also, a belated congratulations to Jasco for hitting +$275. Onwards and upwards, folks! A lot of paper worked very hard to make this game happen. It's nothing like Monopoly. I take it you haven't even seen it? you have no right to say that without actually reading about the game. thats bias. I have a right to say that.. I do read the board game. It is not video game. It just me and I just like to speak up. Do not tell me what to do. Please just read people's comment and listen instead of telling them what to do, will you ? Thanks. It's a sad day when people get hyped over a board game and re-releases. Moving along from the inevitable flame wars these comments sections become, it's great to see there's interest in something like this! I have no doubt that they'll make a fun game out of it all, but I am sad that I do not quite have that many local friends who would come together to play this. The fact that this many people have pledged to it is still rather cool.